Hafez al-Assad was the brutal dictator of the Syrian Arab Republic, ruling with an iron fist and using the tool of terrorism as a threat against his own people and the world. Succeeded at his death by his son, Dr. Bashar al-Assad, it is clear that the apple did not fall far from the tree. In the past two and a half years, more than 160,000 people have been killed in Syria and reportedly 3,000,000 have become dis- placed refugees, camping in various neighboring countries, in addition to millions of additional displaced persons. Under the cover of democracy, Bashar al-Assad called for elections in order to succeed himself as president. 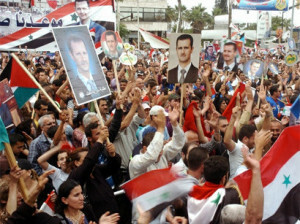 Reuters reported on June 5, under the headline “Assad wins Syrian election with dominant 88.7 percent of vote,” that Assad was successful in “securing a third term in office despite a rag- ing civil war.” The speaker of the Parliament announced, “I declare the victory of Dr. Bashar Hafez Assad as president of the Syrian Arab Republic with an absolute majority of the votes cast in the election,” reporting in a televised address from his office in the Syrian parliament. Also on June 5, The Jerusalem Post reported that “Inspectors overseeing the destruction of Syria’s chemical weapons arsenal have asked President Bashar Assad’s government to clarify dis- parities in its original declaration on its cache of toxic gas,” accord- ing to UN diplomats providing a briefing to the 15-nation UN Security Council on behalf of the Organization for the Prohibition of Chemical Weapons. A June 30 deadline looms for the destruction of all of Syria’s declared chemical weapons, which UN Secretary- General Ban Ki-moon has said will not be met. President Obama had threatened, staged, and — much to the chagrin of U.S. allies, particularly France — canceled at the last minute positioned U.S. military naval strikes in response to the worst chemical weapons attack in decades, which is believed to have been carried out by Assad. The Syrian Arab Republic was first placed on the U.S. Department of State List of State Sponsors of Terror in 1979 and remains on the list. Efforts to reform Syria’s conduct have proven fruitless, all the talk notwithstanding. Syria supports, and is supported by, the Islamic Republic of Iran, the worst sponsor of terrorism in the world. Syria supports, and is supported by, Hezbollah in Lebanon, which has provided troops to support Assad’s army in efforts to defeat the Free Syrian rebels. Hezbollah has long been used by the Islamic Republic of Iran as one of its main proxies for terror, commit- ting the Embassy of Israel bomb- ing in 1992 in Buenos Aires, and the AMIA Jewish Center bomb- ing in 1994. 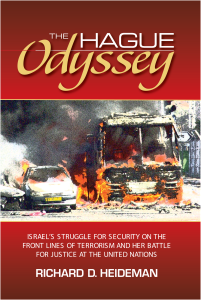 Repeated acts of terrorism have been launched throughout the world, including against Israel and her citizens, taking lives and destroying the fabric of families for decades. Let us remember that the Syrian Arab Republic remains a threat to the people of Israel; remains the key connection between the Islamic Republic of Iran and Lebanon, with Iranian weapons having been moved with impunity across Syria into Lebanon, staged for launch- ing over Israel’s northern border. My law firm brought litigation against the Syrian Arab Republic for sponsoring the EgyptAir Hijacking in 1985, and the Rome Airport Attack in 1985, all commit- ted by the Abu Nidal Organization, a foreign terrorist organization. The U.S. District Court for the District of Columbia has found the Syrian Arab Republic liable as a State Sponsor of Terror, assessing judgments of $601 million, $51 million and approximately $3.4 billion, awarded to victims of terror and their families. Experts testified at a public trial in Washington on Syria’s long and sordid sponsor of heinous murder. With the support of Russia and China at the United Nations Security Council, which recently blocked a resolution of France, Syria has not yet been referred to the International Criminal Court to be held accountable for the terror that Syria has turned on its own citizens. Under the guise of democracy, Assad marches forward, appear- ing in the press in a suit and tie casting his ballot for continuation of his own reign of terror. When will the world act to protect the people of Syria: the children, their mothers, fathers and grandparents, whose lives and families will never be the same? The rights to freedom trampled, their human rights obliterated, they deserve a better day. Yet, as the world dithers, people are dying … supported by despots who vote themselves back into office.